A few Havocs turned out on Saturday 11th October following an invitation from the origanisers of a protest against Doric’s plans for redeveloping the Westway shops and adjoining area. The organisation was a bit confusing and we got in precisely one dance before speeches and so on took over. But we joined the human chain and played some tunes anyway. 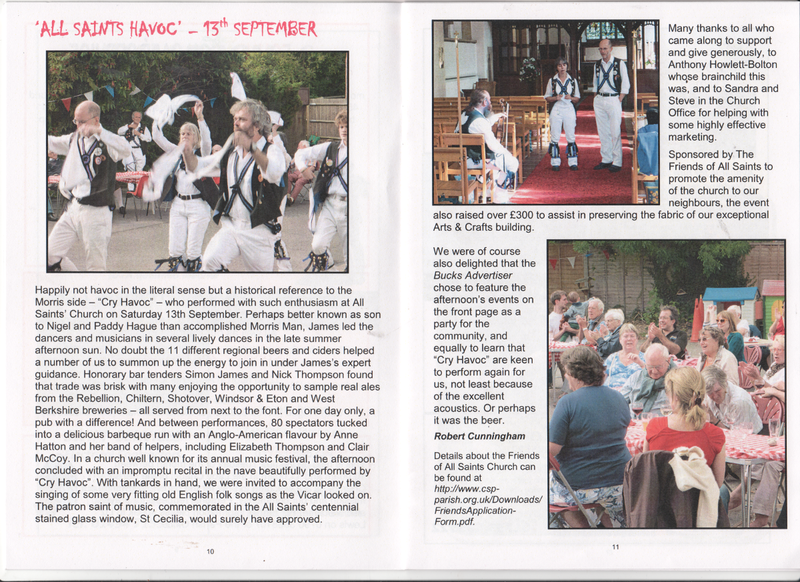 So, for the record, the Morris dancers mentioned in the Oxford Mail report was us! This entry was posted in Uncategorized on October 27, 2014 by Jim Hague. OK, so it’s not exactly The Times, but we’ve made a front page. 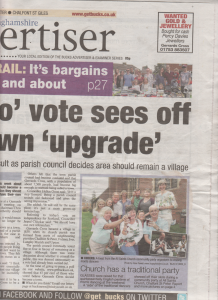 The Buckinghamshire Advertiser wrote up the recent All Saints Beer Festival and there are pictures to go with it. You can read their coverage and see the photos on their website. The story and pictures took up the top half of page 4 in the print edition. And featured on the front page! Well, Pete and Mick manage an inset photo. 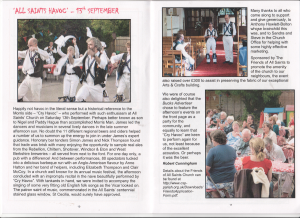 There was a larger writeup with some different pictures in the local parish magazine too. Beer festival coverage with Havoc pics. This entry was posted in Dance Outs on October 4, 2014 by Jim Hague.